Bloodborne is not of a piece with the horror video game canon, but it uses so many of its tools: scarcity of resources, scenes of horrific gore, jump scares triggered by a seemingly bottomless well of body-horrific freaks. 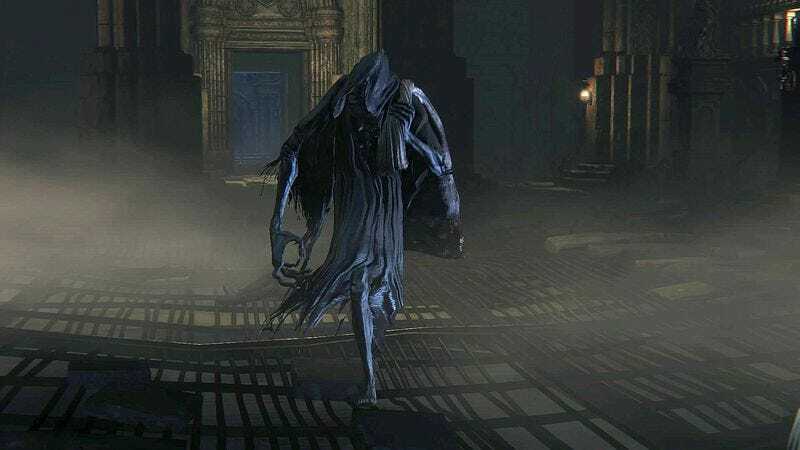 The hunter’s trip through Yharnam’s gothic misery feels like what would happen if John Carpenter, David Cronenberg, and Jennifer Kent took a trip to Cologne but stayed up all night playing Alone In The Dark. As with all games directed by Hidetaka Miyazaki, Bloodborne is about persistence and mastery. Finishing the game isn’t a matter of conserving useful goods and surviving the tough fights alone. Only when you know every corner and how to anticipate the city’s tricks will you actually persevere. In emphasizing familiarity with your surroundings, though, Bloodborne bottles the potent every day horrors of routine and change. Familiarity is the moment that classic video game horror breaks. Staples like Fatal Frame and Resident Evil use the same tools as Bloodborne, but they’re always used to enhance an atmosphere where you’re constantly at the mercy of the unknown. The dog jumping through the window in Resident Evil is scary in the same way as the furry little goblin jumping out from behind a pile of boxes in Old Yharnam. No one’s prepared for some knee-high pile of teeth to pop out and start gnawing on your business the first time you pass through, but in both cases, wasting the mutt or the ghoul involves risking some valuables. Can I really spare the bullets? By forcing you into a cycle of repetition, Bloodborne adds on an upsetting layer of dread to the proceedings. The option to run past everything standing in your way if you know where they are, isn’t always an option. If you’re going to beef up your hunter to survive fighting that skinless, elongated pile of bones and bloody rags waiting in the church at the bottom of Old Yharnam, you’re going to have to kill the goblins, collect those blood echoes, level up, and keep going. The classic, clichéd jeer against any horror protagonist, “Don’t open the door!” is always especially loud in my head playing Bloodborne. The door has to be opened in every horror game; that’s the point. In Miyazaki’s game, though, you have to open the door again and again and again, knowing full well that each pass through an area demands perfect execution of enemies and a possible win over a boss. When your acquaintance with Yharnam runs as deep as it can, the dread at least becomes less immediately terrifying. All those beasts jumping out from behind shadowy corners, all those rarely placed healing items and weapons, every run against the Lovecraftian bosses—the scary things inevitably dull as you persist in the enervating, Sisyphean circuit of exploring, dying, and conquering. In the wake of small victories, familiarity in Bloodborne breeds a delicious contempt. “I know all about you, Yharnam! Watch as I rip you and your stupid giant priests and werewolves apart!” Even that is ultimately twisted, though. Any comfort the game’s desensitizing cycle might have given is obliterated when it changes. In scarce instances, the game tweaks something seemingly small and uses those shifts to scare the ever-loving bejesus out of you. Bosses are the most regular source of frightful change. Each one is an object lesson in how upsetting a broken routine can be. Take the Blood-starved Beast. The first time you reach its lair at the bottom of Old Yharnam, you’d be lucky to have the resources and health to tackle a major fight. If you’re properly equipped, you might even survive long enough to settle into the pattern of its attacks and whittle it down to just a fraction of its vitality. As with all the bosses, though, reducing its health triggers it to change its pattern. Maybe you adjusted to its vicious swipes on a first or second try, but there’s no preparing for the moment it starts constantly oozing poison once you’ve reduced it to a third of its health. Once it does, the fearful panic that ensues likely means death and another trip back to the Hunter’s Dream, your ethereal safe haven. Just like the athlete with the most disciplined diet suddenly brought low by the flu, Bloodborne is always waiting to upset you by altering a rigid routine. It doesn’t restrict those changes to bosses either. If you happen to beat the Blood-starved Beast early on in Bloodborne, places you might already have passed through dozens of times will suddenly get new visitors. Central Yharnam, with its towering staircase to the cathedral, is both one of the first places you become familiar with and one of the first that becomes a ready well for resource gathering. There are plenty of sluggish priests and beefy giants lumbering around, making it a perfect area where you can go, kill, and retreat to build up your hunter’s strength. With each trip, you get a little more adept at speeding through the alleys, maximizing Blood Echo collection and minimizing time spent in dangerous areas. There’s always the risk of slipping up, and there’s the looming threat of the more dangerous places you’re preparing to reenter after leveling up, but it seems as safe a place as you can find away from a lantern in the game. Then the kidnapper shows up. Compared to some of the other enemies, it’s downright unassuming: just another tall, cloaked, long-limbed weirdo in a game full of them. Even the sack slung over its shoulder isn’t that disconcerting. No, the problem with the kidnapper is that it isn’t supposed to be there. After passing through the area for the 50­th time, farming blood and bullets, the sudden appearance of a strange man out in the open is as upsetting as finding the door open when coming home after a vacation. Just slightly altering the environment with a new body is scarier than any misshapen, suppurating monster. And by placing the kidnapper in the middle of a well-trod place and enemies that you’ve learned to take down efficiently, it all but guarantees you’ll try to attack him. That’s when Bloodborne in turn shows its contempt for your familiarity. Confronting the kidnapper and falling to one of his extremely heavy blows doesn’t kill you. The screen goes black and when it pops back up, you’re in a dimly lit cell in an unfamiliar place the game tells you is called The Hypogean Gaol. With no clue where the hell you are and no immediate ability to return to the Hunter’s Dream, you’re trapped and stripped of any confidence. In just a few moments and without taking away any of your abilities, items, or experience, the game completely shatters its status quo. Bloodborne has plenty of small ingredients for scares—monsters hiding in the dark and nerve-wracking moments when your healing blood dries up and ghouls are closing in. It only becomes truly horrifying when it introduces a change to its ingrained rhythm, when it settles you into an uneasy balance of miserable expectation and perseverance only to suddenly and inexorably alter the world. Nothing, after all, is scarier than change.